Today I have for you a fabulous video where I’m sharing a few of my spring favourites! I love seeing these videos that other people have created sharing their own seasonal favourites so I thought I’d jump on the bandwagon. 1. Planet Organic “Calming” tea from Alive organics. I’ll have new videos up next week! 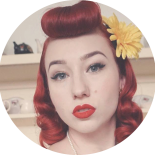 This entry was posted on November 23, 2017 by Miss Lady Lace in tutorial and tagged 1940's, 1950's, blogger, glamour, miss lady lace, miss lady laces pinup blog, perth burlesque, perth pinup, perth pinup blog, perth pinup community, pin up, pinup, pinup blog, pinup blogger, pinup fashion, pinup girl, pinup life, pinup lifestyle, pinup perth, red lips, retro blog, retro girl, retro glamour, spring favourites, the perth pinup community, victory rolls, vintage, vintage blog, vintage blogger, vintage fashion, vintage girl, vintage glamour, vintage perth, vintage pinup blog.